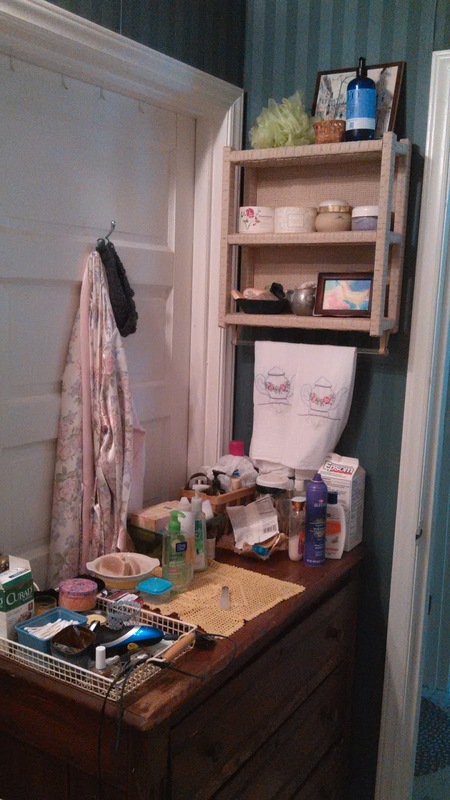 I gave you a tour of our loathsome bathroom a while back, remember? 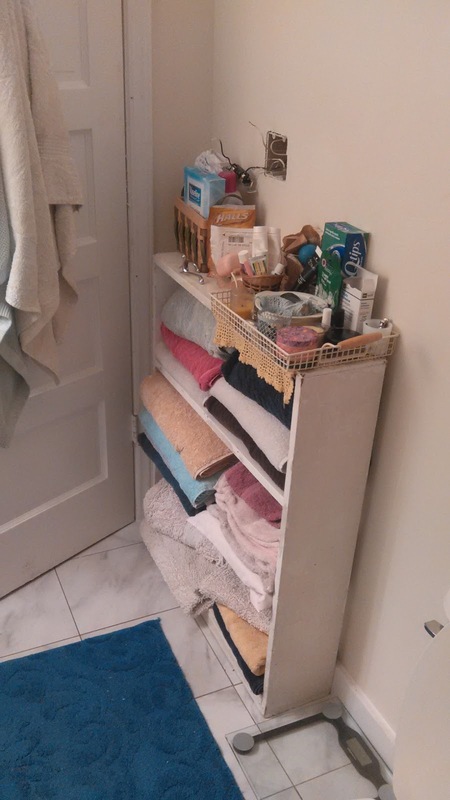 Well, now I can give you a tour of the NEW bathroom, yes, I can! Adam and our friend Joe worked oh-so hard while I was out of town last week, and they truly gave us a brand new room. When I'm soaking in the tub and gazing around at the view, I don't even feel like I'm in the same room. 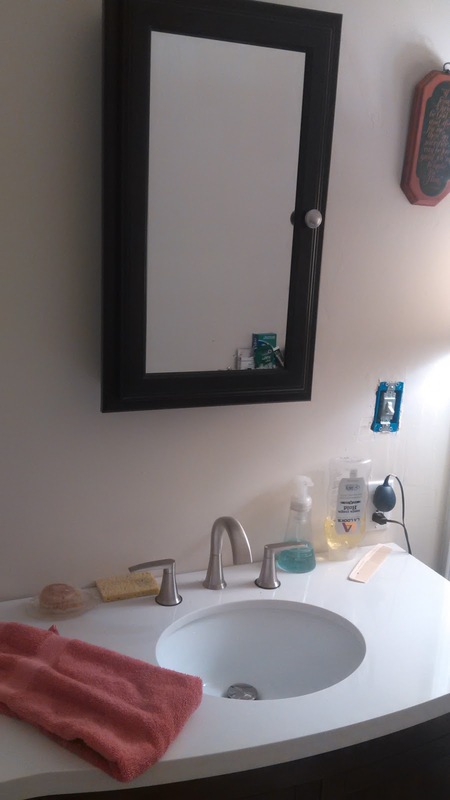 That's a before-and-after of the vanity area. Below is a before-and-after of the corner near the vanity. We haven't finished the light fixtures in the room, so right now we only have that floor lamp. I rather like the soft yellow glow it gives everything -- very soothing. But it does take up space. 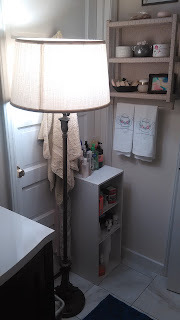 Soon we'll have a light above the vanity and the lamp will go back to the living room. Oh my goodness, the difference in tubs cannot even be described! 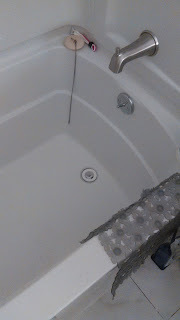 The new tub is so very deep. 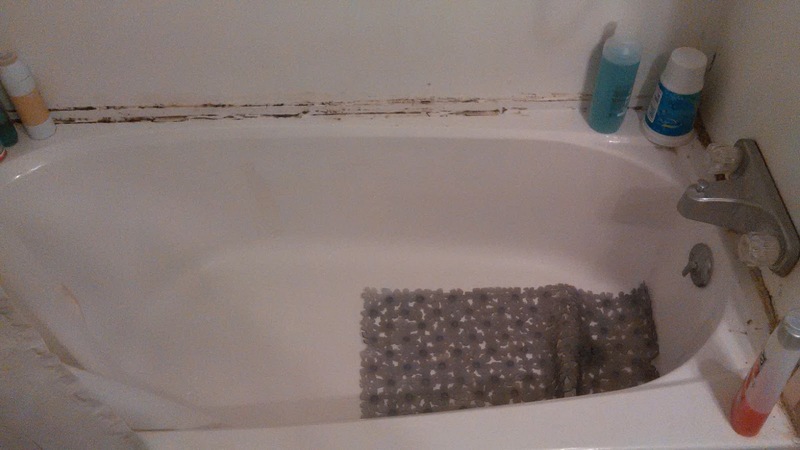 We are great bath-takers and tub-soakers, and this is a feature we will nearly every day. Plus, it's clean and mildew-free, and has a very nice slope for reclining. 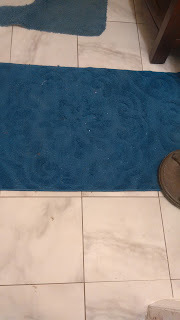 I love the new shower surround. clutter up the vanity top. Somehow I was able to replace the three huge cabinets and the entire dresser with this narrow shelf unit behind the door -- you hardly know it's there! -- and a little cubby in the other corner. I threw out some stuff, decided to keep my sheets elsewhere, and simply reorganized. I'm so happy with the result: a cleaner, tidier, prettier room. Many thanks to Adam and Joe for all their hard work! The house is (mostly) put back together, and life as we know it can proceed ... with a bathroom. That must be a huge relief. 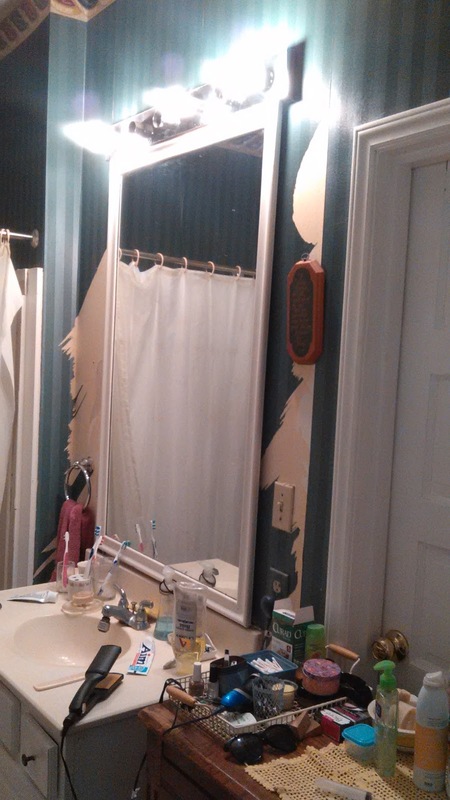 There is no joy in using a dilapidated bathroom. I'm glad the floor lamp is temporary. My health and safety brain cells started twitching when I saw it. It is plugged into a working GFCI circuit. WooooooW! This is just great! A nice bathroom is a wonderful thing. Hurray for you! Congrats to Adam and Joe for all of their hard work. It does look lovely. 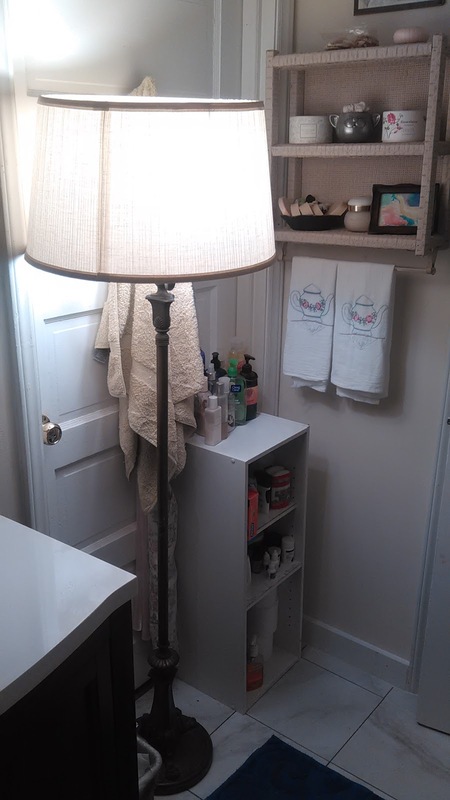 You've inspired me to finish up some work in my bathroom. I don't think Glorious! is too strong a word for a new bathroom. 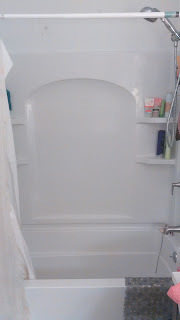 I would be thrilled with these changes -- I have a great shower but no tub, because I never wanted one before, but in the last year I have often wished for somewhere to soak. 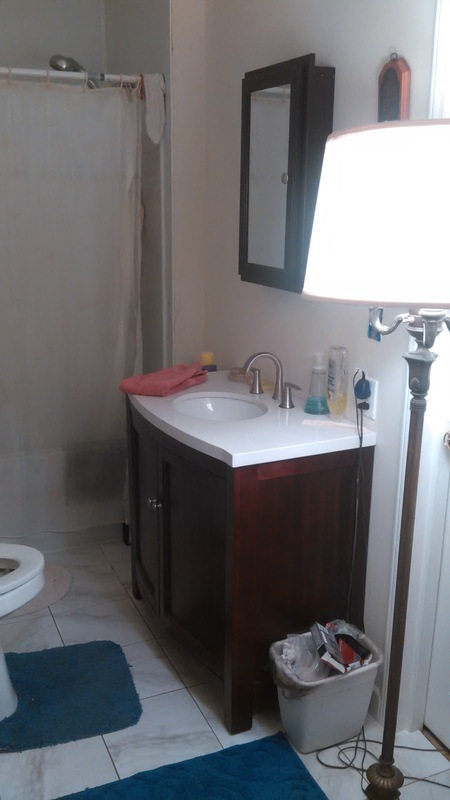 Your remodeling energy is commendable, and your new bathroom is a small but important reward. Wow what a difference. It looks great. Oh, this is so nice! I am a tub lover, too. Wow, what a change! It looks wonderful! The tub is splendid. We have a deep soaking tub too and it's sure nice when you don't feel good or your muscles ache. I also noticed that your shower has a hand-held sprayer. OH I love mine. So nice for so many things -- especially cleaning the shower/tub. Well done, Adam and Joe.